This is my 5th kit of my favorite armour subject, the Sd.Kfz.251. 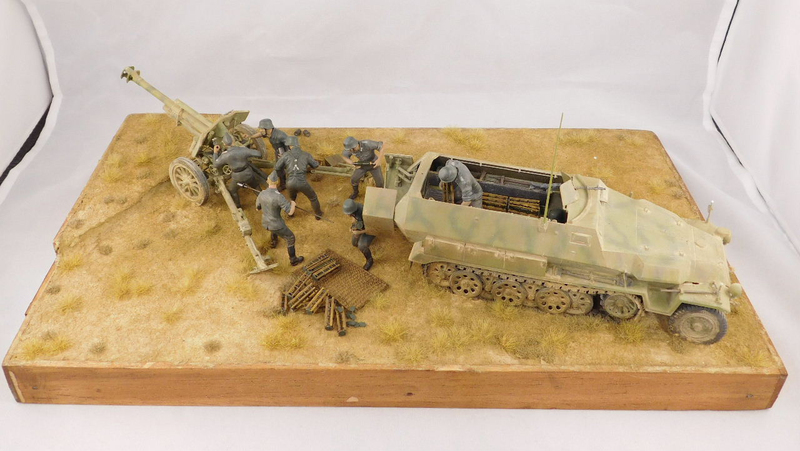 AFV Club's 1/35 scale 251/4 Ausf C comes with a 10.5cm gun and their 251 kits are my preferred brand. I added two Eduard PE sets, one for the 251 and one for the kit, along with a set of AFV Club 10.5cm ammo and seven figures from Trumpeter. The vehicle depicted is from the first Pz Div which was sent to Greece in 1943 as a result of operation mincemeat. So we have the crew conducting live fire training as part of anti invasion exercises for an invasion which did not come. This was my favorite 251 so far, the AFV Club kits are a joy to build and very nicely detailed.